As January cold settles into the mountains of Ely, Cave Lake comes alive with the annual Fire & Ice Festival. The festival melds artistic skill, physical endurance and the beauty of dark skies and bright lights into a weekend celebration open to all. The festival draws up to 2,000 spectators throughout the weekend, according to Ed Spear, Director of the White Pine County Tourism and Recreation Board. Sculptors, up to 20 participating some years, spend the weekend on Cave Lake, creating wonders from frozen water. “They don’t want to start too early,” explained Spear. Warm sun can spell disaster for the frosty creations. Artists draw water for their creations from holes drilled in Cave Lake’s frozen surface. Viewers can come out and watch the artists’ progress throughout the three days. Campfires in barrels on the lake surface encourage visitors to warm their hands and linger. A frozen lake and snow sculptures provide the ice for the festival. Fireworks provide the fire. 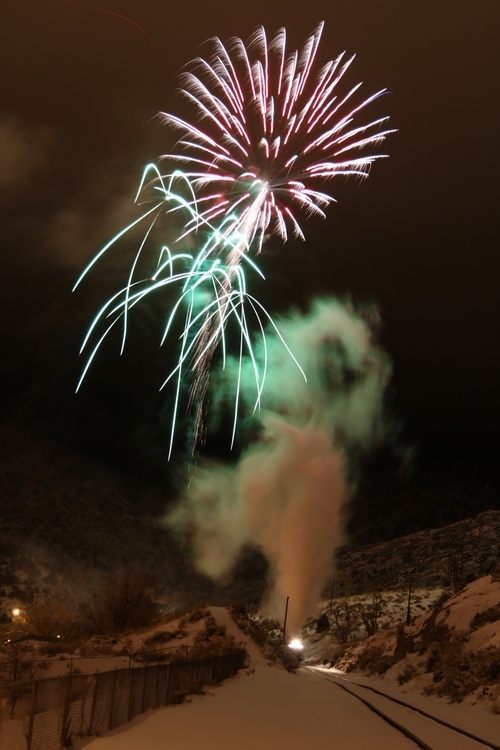 Fireworks are set off Saturday from the Nevada Northern Railway excursion train and Sunday from a cannon on the lake. Judging of the sculptures includes both a people’s choice award and a $1,000 winner chosen by local community members, as well as second and third place prizes. 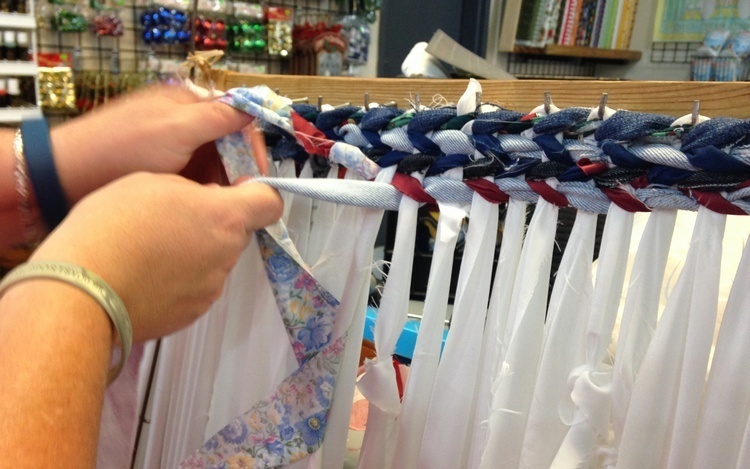 With only a $25 entry fee, why not try your hand at a winter creation? Or take a weekend adventure into the mountains, celebrate winter and wonder at the elemental marvels of fire and ice. “I have always wanted to make a twined rug,” said Jennifer Carter, as she twisted and wove scraps leftover from her quilting and sewing projects into a 2 1/2 by 3 1/2 rug on a handmade loom. She is learning this centuries-old skill at Ely’s newest craft shop, Desert Rose Ceramics and Crafts, opened in September. It takes twining teacher Emily Hicks about nine hours to complete one of the rugs. She and her mother taught themselves how to string a warp of old sheets and twine two scraps of fabric into sturdy rugs after discovering an abandoned weaving frame in an old school in Utah, years ago. “It’s fun to sit here and visit,” Carter said, making steady progress on her rug. Teacher Hicks leaned in to appraise Carter’s work: “You missed one,” she gently corrected. “That’s right,” added Hicks, who has demonstrated the twining technique at French and Indian War reenactments in Missouri. Desert Rose owner Kelly Kelsey relocated to Ely this year, bringing with her seven years of experience running a crafts store in Wendover. She also brought thousands of ceramic molds. Rosie Adamson has become a regular at the shop. She had never painted before coming to the store and took to it, completing several gifts for members of her family. 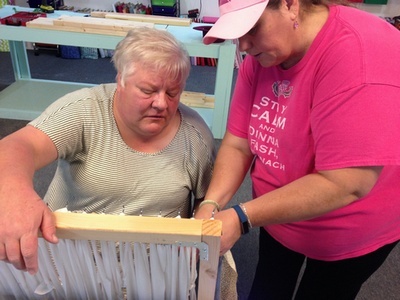 Desert Rose provides not only an array of crafting supplies from yarn to paints, but a gathering place. With open ceilings and organized shelves, Kelly Kelsey, along with her co-owner and mother Sandy Kelsey, has created a tranquil learning environment right on Ely’s busy main street. “If anyone is interested in any kind of class,” Kelsey said, “we’ll try to find a teacher.” Upcoming offerings include stained glass, crocheting, knitting and more. “The space is here,” she said, waving an arm like a magician, taking in the possibilities latent in arts materials waiting to be transformed by crafters’ hands. On a trip through Ely, why not arrange to twine a rug, paint a sculpture or start in on knitting a sweater? You’ll go home with memories and a tangible souvenir. 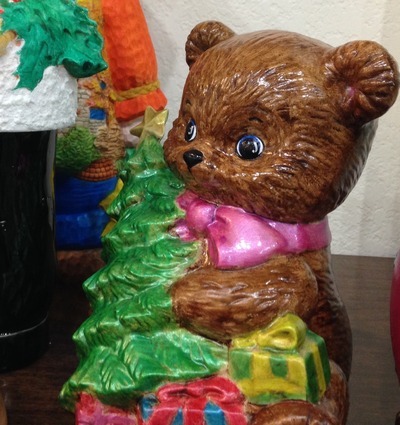 Find Desert Rose Ceramics & Crafts at 1676 Aultman St. Call (775) 289-7959 for details on classes and supplies.The store is open 10 am – 6 pm, Monday through Saturday. 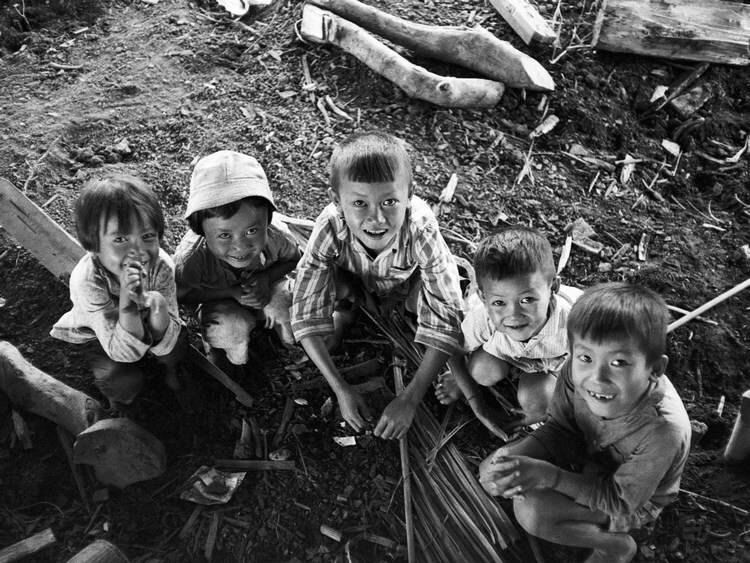 If you are passing through Ely in December, be sure and stop in at the White Pine Public Museum to catch the traveling exhibit of poignant photos of Vietnam taken from June 1968 to June 1969 by Steven Burchik. Burchik, now a California resident, was a sergeant serving as a forward observer in a mortar platoon with the Army’s 1st Infantry Division that year. Bringing with him a personal camera, Burchik received permission to take photos as a hobby. Although he brought the camera into the field only about twice a month, he managed to take more than 4,000 photographs. Burchik calls himself “lucky.” He made it home and established a career and family, never discussing his service. Years later, after his son started asking questions for a high school assignment, Burchik began to tell stories from his time in Vietnam. He discovered that his wife had stored in shoe boxes all the letters Burchik sent her while he was overseas. With his memories, the letters, research, interviews and photos, Burchik wrote the award-winning Compass and a Camera, an account of a soldier’s daily life in conflict. The photos reveal the eye of a curious young person, abroad in a new place, feeling deep emotions from loss to delight as he navigates the war. Burchik finds moments of beauty in faces and places. The photos create a pictorial representation of peoples’ shared humanity. Located at 2000 Aultman Street, the White Pine Public Museum hours are 10 am – 4 pm. Call (775) 289-4710 for information. A $5 donation is suggested. 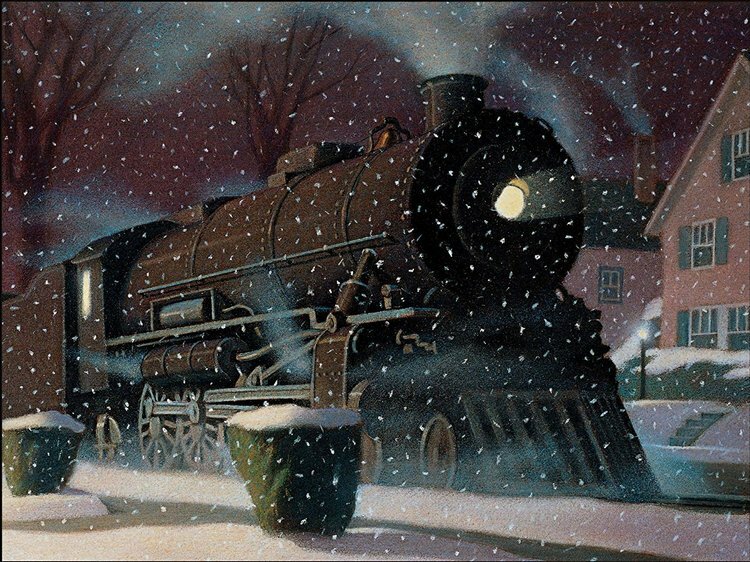 And also in December, there’s still time to hop on The Polar Express along the Nevada Northern Railway through December 30. A family-friendly event that includes sipping hot chocolate and nibbling cookies while riding the train clad in pajamas. Enjoy songs, stories and a visit from Santa Claus and the elves.